Let’s all just agree that the best part of going to holiday parties is the appetizers. I mean is there really anything better than getting perfectly portioned bites of delicious food? 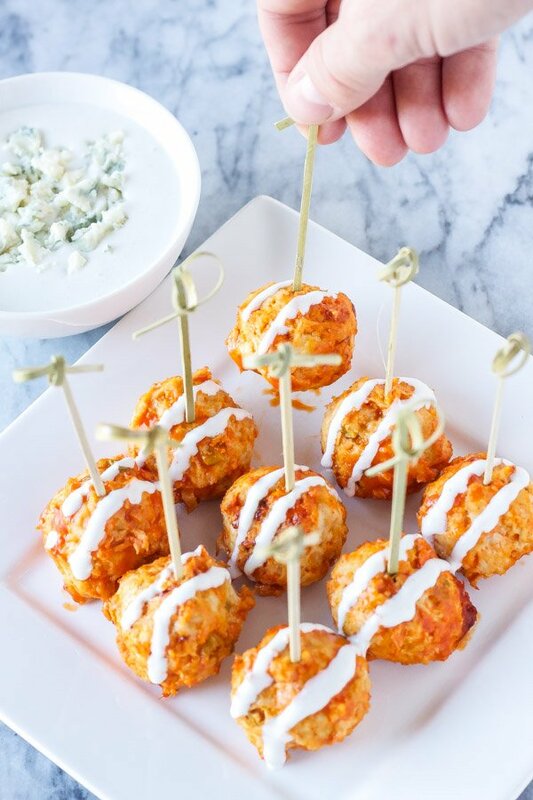 Today I’m sharing with you a spicy, cheesy, meaty appetizer that will thrill your guests, Buffalo Chicken and Blue Cheese Stuffed Meatballs. These delicious meatballs have so many good things going for them that I’m not sure where to start. Let’s start with the buffalo sauce. If you love wings then you are guaranteed to love these meatballs. They have just the right amount of heat and sauciness. I actually prefer these meatballs over wings for a couple reasons. 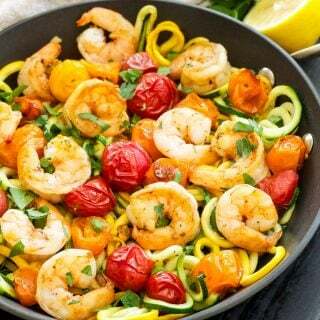 First, they are so much healthier which means, at the end of the night when you realized you ate 5 of the meatballs you don’t have to feel guilty. 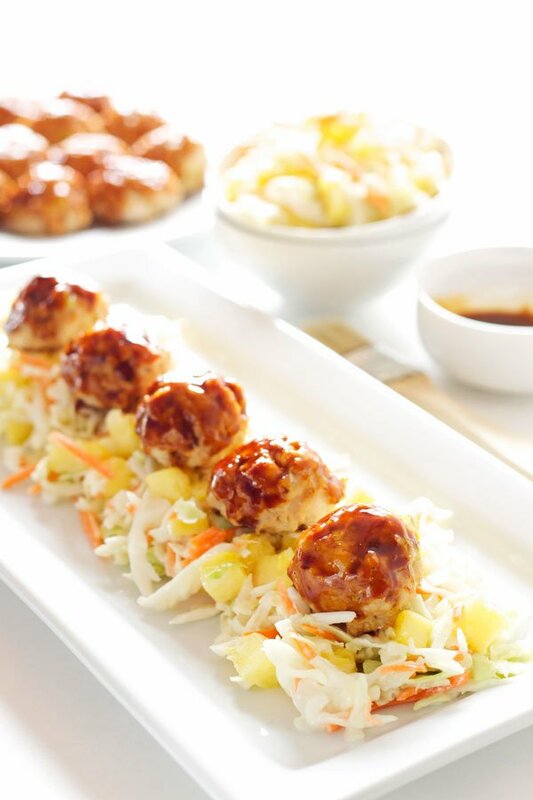 The buffalo chicken meatballs are made with lean ground chicken or turkey, green onion, spices, an egg and panko to bind them together and keep the meatballs moist. The other reason I love these more than chicken wings is that they are a lot less messy to eat. Seriously, do you really want to have wing sauce covering your face and hands at your holiday party? I didn’t think so. 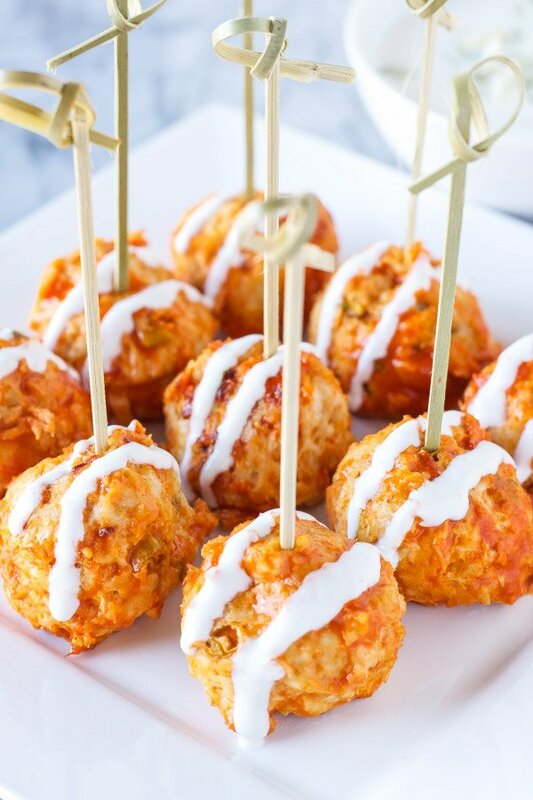 Moving on to what really sets this buffalo chicken meatball apart from the rest, it’s stuffed with blue cheese! Blue cheese and buffalo sauce are made for each other. If you’ve never tried the two together it’s a must. Aside from dessert, nothing gets me more excited than a piece of cheese stuffed in a meatball. I love the way it melts in the meat and gives you that perfect gooey bite! To finish off these perfect Buffalo Chicken and Blue Cheese Stuffed Meatballs I made a blue cheese dipping sauce. Oh now you’re excited! Who doesn’t get excited when they see dip?! Dip to a meatball, or chip, or whatever, is the equivalent to frosting on a cupcake, one without the other isn’t complete. 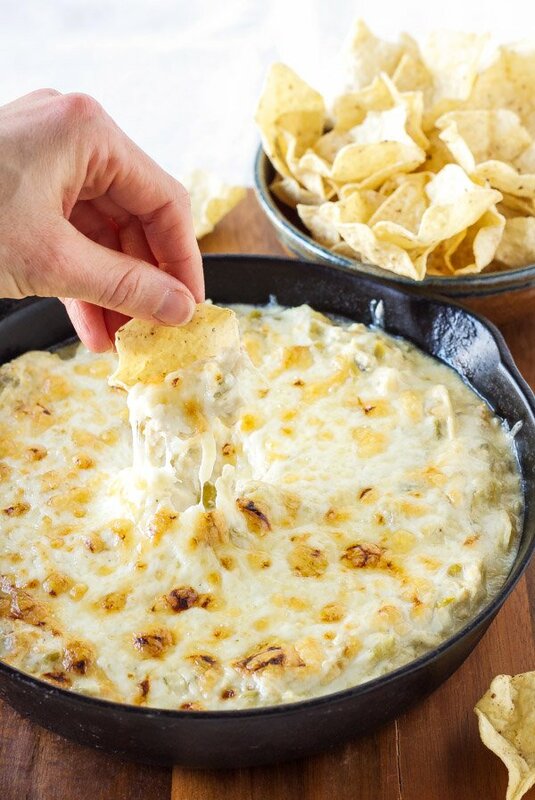 Not only is this dip creamy and delicious, but it also cuts the heat of the buffalo sauce. 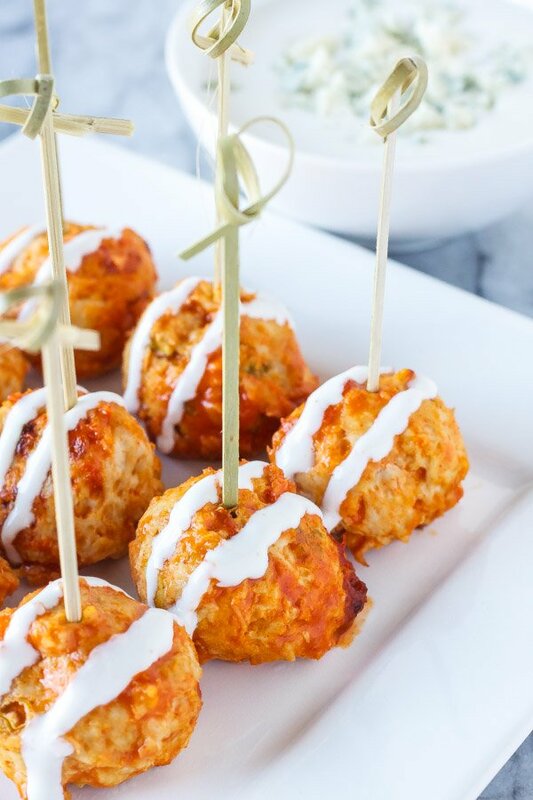 Hopefully by now I’ve convinced you that you need to make these Buffalo Chicken and Blue Cheese Stuffed Meatballs! I promise your guests will gobble up these moist, cheesy, bite sized meatballs and be begging you for more! 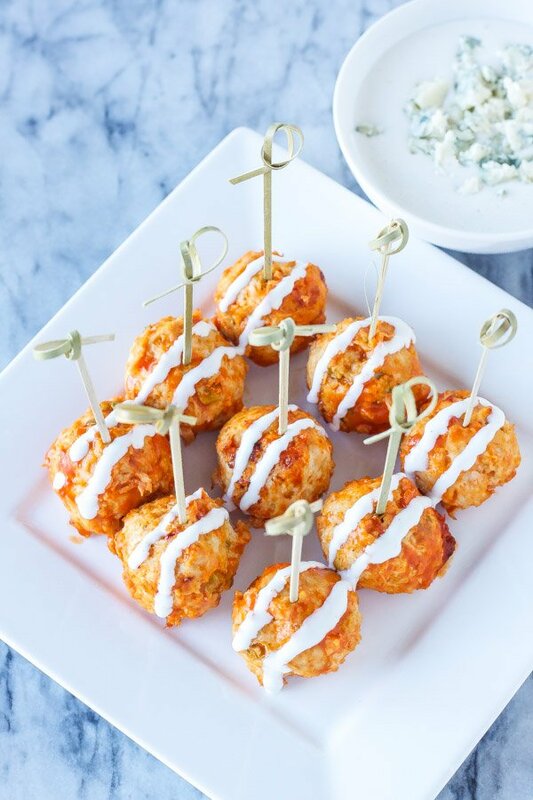 These blue cheese stuffed meatballs are a healthier alternative to buffalo chicken wings, the perfect bite sized appetizer! Preheat oven to 400 degrees and line a baking sheet with parchment paper, set aside. In a large bowl whisk together the panko, spices, green onions, and egg. Add the ground chicken or turkey to the bowl and using your hands mix everything together. Using a small cookie scoop or a tablespoon measurer for the meatballs. Stuff a piece of the blue cheese into the center of the meatball and cover it completely with the meat mixture. Place the meatballs on the lined baking sheet and place them on the middle rack of the oven, baking for 10 minutes, until they are browned. Remove the meatballs from the oven and put them in a slow cooker sprayed with cooking spray. Pour the buffalo wing sauce over the meatballs and toss them until they are all coated in the sauce. Set the slow cooker to low and heat them for an hour. 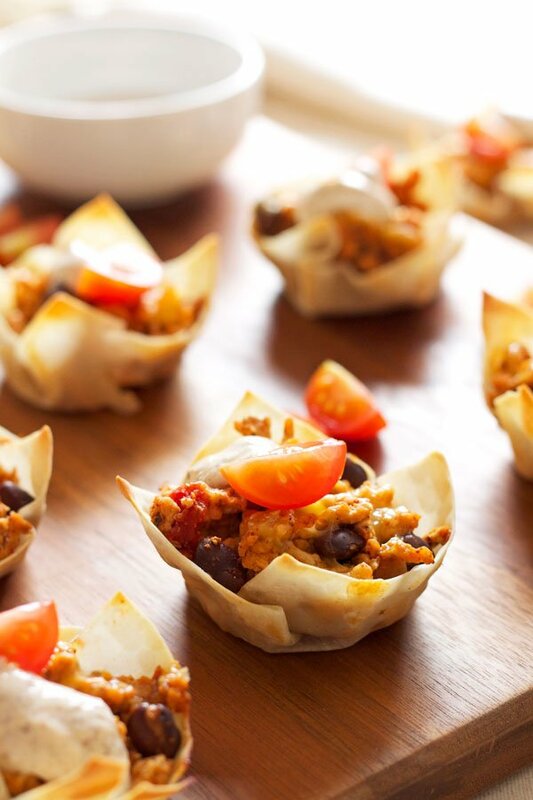 Serve them in the slow cooker or on a serving platter with toothpicks. In a blender add all of the ingredients. Pour into a serving dish, top with more blue cheese if desired, and serve along side the meatballs. 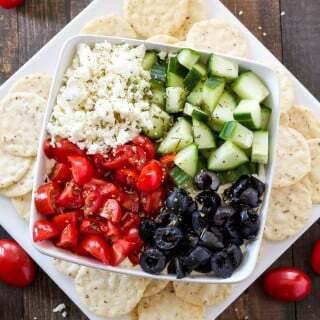 Perfect party appetizers! Love the blue cheese center! Thanks Jessica! The blue cheese was my favorite part! I love buffalo chicken and blue cheese together. Stuffing meatballs with cheese? Genius. Thanks Carla! Buffalo chicken and blue cheese are one of my favs! Thanks Sherri! Wings are definitely not party friendly in my book, unless you like walking around all sticky and messy. The cheese if totally the best surprise! Oh Yay! Thanks so much for trying them Ashley and I'm glad you liked them! I think the little chunk of blue cheese in the middle is my favorite part!